There are a number of assisted recoveries that have the assisting kayaker drain the water from the kayak before the paddler in the water re-enters their kayak. See USK article, "T-Recovery" as one of the typical kayak draining recoveries. Draining the water before re-entry does get the water out more quickly, however it keeps the paddler in the water longer. 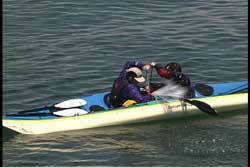 In very rough conditions trying to drain a kayak can be difficult and opens the assisting kayaker to a potential capsize while trying to drain the kayak. The re-enter and pump recovery provides reliable support for both kayakers.